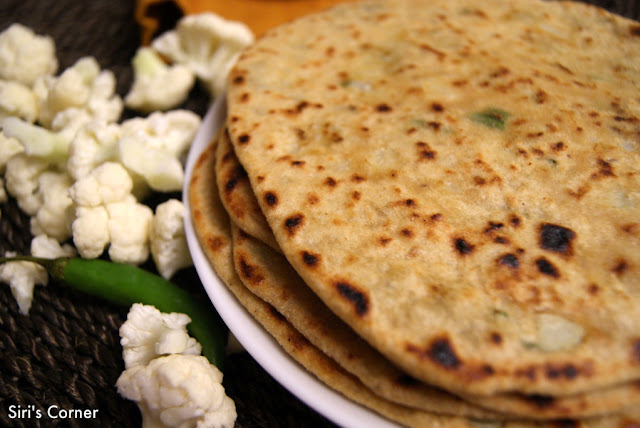 A 'Paratha' is basically a pan-fried Indian flatbread. With innumerable number of options as stuffing, this dish is very popularly made in the northern part of India. This is my first, successful attempt to make 'Gobhi Paratha', with the stuffing properly tucked in between the layers (and not oozing out, like it did in past times). This is perfect for breakfast, brunch, lunch, dinner and for almost anytime & any day. Enjoy. Cut cauliflower into florets and grate. We need 2 cups of shredded cauliflower. In a mixing bowl, add 1 cup of whole wheat flour and 1/2 tsp of salt. Add water (about 1/2 cup) little by little to form a nice, soft dough. Apply little oil on the surface, cover with a damp towel or plastic wrap. Rest it for about 10-15 minutes. In another bowl, mix - shredded cauliflower with 1 tsp of salt, chopped cilantro, finely minced green chillies (depending on your spice level), 1/2 tsp of Ajwain (carom seeds) and 1/2 tsp of cumin seeds. Thoroughly mix them all and rest for 10-15 minutes as it leaves excess water.. Squeeze out the water out of the cauliflower mixture. This step of resting and squeezing out the excess water is very important to avoid watery-stuffing. Knead the dough a little bit more and make 6 small, lemon-sized balls out of it. Roll each one into about a 3 inch diameter roti, place about 1 tbsp of stuffing in the middle and close it, like you do for a dumpling. Do the same for the rest of them too. On a hot griddle, place one paratha at-a-time, on medium heat , Cook on one side (with some bubbles popping up) and then to the other side. Once done, spear some desi ghee or some oil. Serve. 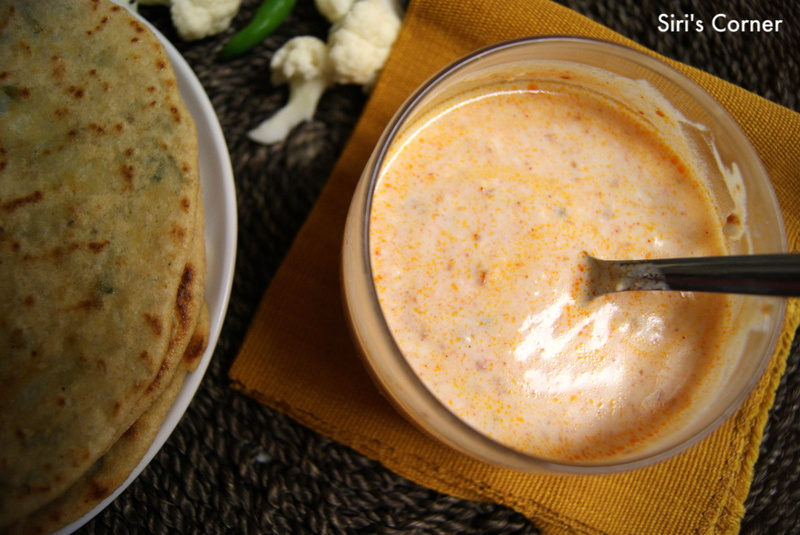 If you are very very hungry or have short time on hand - then pickle raita is the best accompaniment for almost anything, especially for such parathas. All you have to do is beat the yogurt for couple of minutes and mix some of your favorite pickle (I added tomato) into it. - less or more, depending on how spicy you want. The coolness from the yogurt works so well with the heat from the pickle. this is definitely my all-time favorite quickie side-dish. Hope you are having a fun Thanksgiving week. Love the pickle raita. You know what, I make ketchup raitas for parathas. just mix some kethcup and yogurt. Yumm! Lovely combo siri...both of them looks good!! Paratha looks great. This is the first time I have come across pickle raitha. Thanks for sharing..
Pickle raita sounds absolutely delicious, would love to have ur gobi paratha with that droolworthy pickle raita rite now..lovely..
Love gobhi paratha and what I am liking more is your pickle raita, never made it, but it sure sounds tempting and mouth watering. It's my first time here, you have so many great recipes. I love Indian food and cook it quite often but the breads are something I need a lot of practice with. I will definitely be trying your Paratha recipe, sounds delicious. Thanks for sharing. Pickle raita sound interesting.. Lovely combo..
and the pics are beautiful..